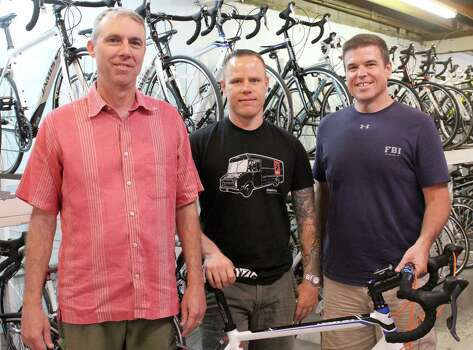 Ron Kerr, left, Fred Zapalac and David Chaney will ride across Rwanda June 18-22 to increase awareness of the 20th anniversary of the Rwandan genocide. Heights resident David Chaney, along with two of his friends, fellow Heights resident Ron Kerr and Fred Zapalac of Oak Forest, will cycle across Rwanda to bring awareness to the 20th anniversary of the genocide that killed approximately 1 million people in 1994. The 200-mile Ride for the Survivors began as an idea when Chaney, an accountant, turned 39. He had begun his weight loss journey years before but was still 65 pounds shy of his goal. Chaney said he thought that planning this trip would be good motivation for him to lose the weight and to spread awareness about the genocide’s anniversary. “I figured if I started telling everyone that I was going to ride a bicycle across Rwanda then I would have to actually do it,” he said. Chaney has been involved with nonprofits in Africa since 2008, having volunteered with groups in Uganda and Kenya. Rwanda, however, is where he said he was able to help the most. The 1994 genocide resulted after some Hutu political leaders agitated for violence against the Tutsi ethnic group and moderate Hutus, resulting in massacres throughout the country. Chaney volunteered with a non-governmental organization called the Survivors Fund, which helps support the survivors of the genocide, and helped the organization with its accounting needs. Now Chaney is a trustee. The ride will be from June 18-22 and will start at Rwanda’s border with Congo and end at the border with Tanzania. “I just wanted to be able to do it during the period of mourning (to commemorate the time of year when the deaths occurred), which is between April 7 and July 15,” Chaney said. This year for the anniversary, the country held a commemoration ceremony, and Rwandan President Paul Kagame lit a flame to burn for as long as the genocide lasted. The three riders will travel through rugged terrain. Mountains rising up to 8,000 feet will be in the way of the finish line. They will also be accompanied by a guide, a porter and a support vehicle with a trailer. Chaney and Zapalac, 38, have ridden together for a few years and are close friends. Zapalac was a freshman in college when the genocide occurred in 1994, but it wasn’t until he was asked to join the cause that he began to research and learn about it. “I like to travel and I like to ride bikes, but after I decided I was going to do it I began to read up and on it and it’s become a personal journey for me,” Zapalac said. The third member of the team, 53-year-old geophysicist Ron Kerr, has only been riding for 12 years but has been involved with nonprofits for longer, as he used to work with the Houston chapter with Amnesty International. When he heard about Chaney’s plans, he wanted to join in. The four-day ride also marks another milestone for Chaney, who will celebrate 11 years of sobriety. So far about $30,000 has been raised for The Survivors Fund, Zapalac said. To donate or for more information, visit www.rideforthesurvivors.com.